Lock in a great price for Design 4 Rooms – rated 9 by recent guests! Decorations are new and comfort to stay. Very good location. Great and hospitable host, parking at a parking garage nearby was perfect and the host provided all detailed information prior to our arrival. The room was modern and clean. If you were driving this property is in a great location to the public parking garage. There is also a wonderful market around the corner with fresh fruits, vegetables and an amazing deli with house made meats and cheeses. Very nice rooms. Four staircase walks UP, no other enhance! Bkfst at a bar on the corner, only pastry type offering (1). Great location on the island of Ortygia. Within 15 minutes walking distance of anywhere on the island. Room design was exceptional and felt like you were in an upscale boutique hotel. Nearby farmer's market that is open daily with fresh fruit, meats, nuts, lunch options. Featuring accommodations with free WiFi, air conditioning and TV, Design 4 Rooms is located less than 0.6 mi from Syracuse Cathedral and a 16-minute walk from Porto Piccolo. A fridge is also provided, as well as a coffee machine and a kettle. A continental or italian breakfast is served daily at a bar/restaurant nearby where guests could also taste local food. Archaeological Park of Neapolis is 1.3 mi from the bed and breakfast. The nearest airport is Catania Fontanarossa Airport, 39 mi from the property. This property is also rated for the best value in Syracuse! Guests are getting more for their money when compared to other properties in this city. 뀐 Located in the real heart of Syracuse, this property has an excellent location score of 9.5! When would you like to stay at Design 4 Rooms? Area Info – This neighborhood is a great choice for travelers interested in ambiance, atmosphere and architecture – Check location Excellent location – show map Guests loved walking around the neighborhood! House Rules Design 4 Rooms takes special requests – add in the next step! Please inform Design 4 Rooms of your expected arrival time in advance. You can use the Special Requests box when booking, or contact the property directly using the contact details in your confirmation. Could do with some extra cutlery and plates in the shared kitchen space. Only found one spoon! The location is great, so are the huge windows and a sunny balcony. The staff is very friendly and helpful. Delicious panini nearby (Borderi). Ortiga itself is very beautiful. Breakfast is arranged at different site which is 600 meters away and only accept check in from 15:00pm. That's so very cheap and disgusting fraud! This is one appartment in a very old building, consisting of 4 rooms and a so called living room + kitchen in front of the bedrooms, no elevator. I paid for a Family suite with 2 double beds /that was written on booking.com/ On spot we were accommodated in a room with 1 double bed and a sofa bed. You can hear every noise of the other guests, no privacy, no breakfast /you receive vouchers for cafes in the area - very comfortable when you are travelling with kids/. Nothing after they solved an incident we had. Decorated with very good taste. Excellent location if you go by car with a paid parking just 1 block away. Nice balcony overlooking a street fair. 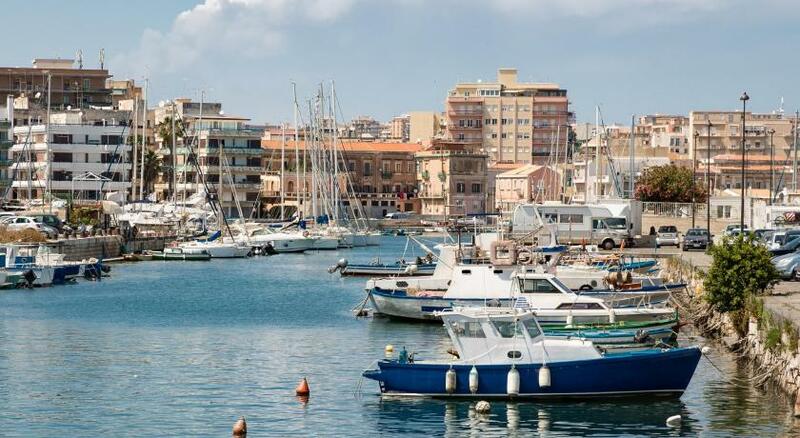 Nice 5 min walk to Ortigia's beautiful areas. Breakfast was provided at bar/restaurant 20 mts from the property (Good sandwich or pastry with coffee or tea) Very friendly people. Communication with Paolo was smooth and check in and out very simple. The noise on the street practically does not stop - restaurants make noise until two o'clock in the morning (minimum), and from four to five in the morning begin to make very loud noise the fishmarket. High humidity - towels practically do not dry out (we rested in the middle of September). Glass walls in the bathroom-toilet can be a problem if you're not a couple or a single traveler. A hotel with a beautiful design and a good location: on the other side of the street is the wonderful restaurant Kantunera with incredibly delicious food. Parking is in a five-minute walk. All sights - within walking distance. Near the hotel there is a fishmarket (this is a plus and a minus) and a shop where you can buy water (or anything else you want). Breakfast - in a cafe in the same building (overlooking the sea), delicious croissants and cappuccino. Excellent hotel owners, with whom you can quickly solve any problem. In the hotel in the common area - coffee machine, kettle, tea / coffee, biscuits. This wasn’t an issue for us, but if you have mobility issues there are several flights of stairs to climb and no elevator.